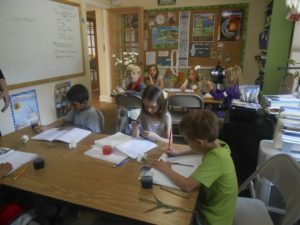 The lower school curriculum emphasizes learning by exploration and employs a wide range of educational strategies. Curriculum designed for gifted learners is utilized, such as the Junior Great Books Discussion program, and a language arts program developed by the Center for Gifted Education at the College of William and Mary. 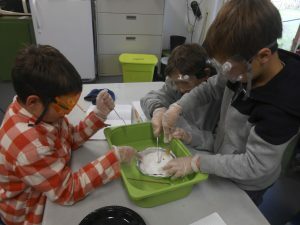 A hands on approach is the primary technique used in the math and science areas. 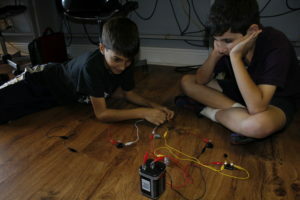 Students are given the opportunity to explore areas of interest in sufficient depth to satisfy their sense of discovery. Students in the lower school develop a strong foundation in academics while they learn to gather and evaluate information, identify and understand relationships, develop and master critical thinking skills, and communicate effectively and meaningfully. Small group projects are balanced by group discussions and individualized study. Affective learning and social development is a crucial element in the lower school. Self-awareness, interpersonal skills, and giftedness are a few of the concepts covered in the group dynamics program Low teacher/student ratios enable teachers to provide individual support and guidance. Individualized learning plans enable students to work at their own pace. Students are grouped with like learners, based on their social / emotional levels, as well as challenge levels.Adjustments are made for individual learning styles and personalities. 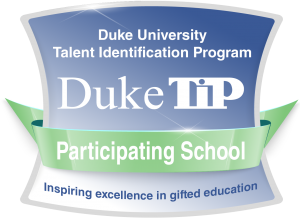 Students are supported by faculty that understands the unique needs and learning styles of gifted students. In our community-based environment, students develop a strong sense of self and a sense of belonging. These areas of development ensure a healthy, happy learning environment. Lower school students develop life-long learning skills and are helped to reach their full potential. These students will be prepared to enter our global community with confidence, potential, and the ability to approach challenges with creativity, skill, and understanding of our differences and interdependence. Throughout the years spent in the primary and beginning intermediate levels, many aspects of development are experienced and mastered. Instilling the love of learning is where it all begins. From there, self-confidence, responsibility, and independence develop. Students become responsible for their own learning and learn how to become adept at time-management. They become comfortable with a complex schedule, one that may change daily. Extending the classroom to the community allows for life experience learning and provides interaction between students and their environment. What makes our Lower School Curriculum Different? All students study Spanish, Computer Design, Group Dynamics (character development), Music, Art, and PE, in addition to the core subjects. These courses are taught by specialist teachers throughout the school year. 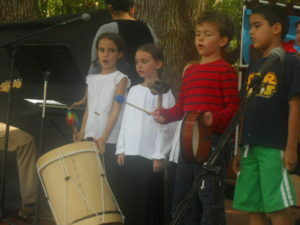 Students in the upper levels of the Lower School also study Latin and Drama. The curriculum is specifically designed to meet the needs of high ability, advanced learners. Even our youngest students participate in discussions and activities that promote higher level thinking skills, problem solving techniques, interpretive analysis, and thinking outside of the box. There is a strong support system for students’ emotional and social needs. Our Faculty is skilled in addressing the needs of gifted and advanced learners and there is close contact with parents and families. Our students are excited about learning and enjoy coming to school each day.